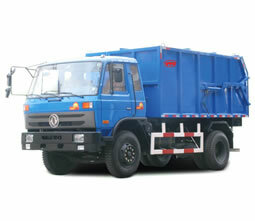 We are one of the sealed garbage truck manufacturers in China. This page will detail some characteristics of our sealed garbage truck. 1. This garbage truck is an ideal vehicle for transferring wastes from a garbage transfer station. 2. The fully sealed garbage containing container can effectively prevent wastes leaking and secondary pollution. 3. The lifting mechanism is designed based on advanced technique, which ensures a stable and reliable truck operation. 4. Manual hydraulic operation makes this garbage truck easy for control. 5. The vehicle is characterized by aesthetical structure, superior performance, and reasonable price. The technical parameters are subject to change without prior notice. As an agriculture machinery, construction equipment and concrete mixer manufacturer and supplier with over 50 years experience, we can provide a wide range of products, like garbage trucks, wheeled tractors, pickup trucks, forklifts and diggers, etc. which are CE, E-mark and CCC certified. Due to reliable performance and reasonable prices, our products are extensively used in Europe, America, Australia, Africa and Asia, etc. If you want to know more, please contact us immediately. Thanks.